On June 24, 2009, the U.S. Department of the Interior (DOI)The United States department charged with conservation and development of natural resources. The U.S. Department of the Interior uses sound science to manage and sustain America’s lands, water, wildlife, and energy resources, honors our nation’s responsibilities to tribal nations, and advocates for America’s island communities. directed the Pacific Gas and Electric Company (PG&E) to remove debris that had been deposited within a ravine south of the Topock Compressor Station (Station) through the issuance of the Area of Concern (AOC)Areas outside of the source remediation site that are being evaluated and may be contaminated due to past practices and/or proximity to the source site. These areas are subject to the overall site’s environmental investigation to determine if they will also need to be remediated. 4 Debris Ravine Time-Critical Removal Action (TCRA)A time sensitive action to stabilize and mitigate the threat of release of contaminated material. It is not intended to substitute for any remedial activities or be the final remedy. Memorandum. 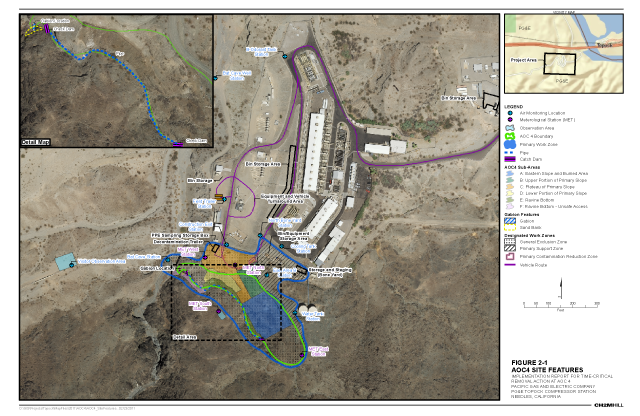 The TCRA was necessary to control the potential migration of contamination from PG&E to the Havasu Wildlife Refuge property. The debris was deposited as a result of PG&E’s historical waste disposal practices and contains construction debris, burn ash, and other miscellaneous Topock Project Site (Site)-related items. The debris and the underlying soil were determined to contain elevated levels of metals, polychlorinated biphenyls, dioxins, and furans. Work planning and consultation for the removal activities immediately ensued, and DOI approved PG&E’s Work Plan on December 15, 2009. The AOC 4 Debris Ravine TCRA field activities were performed from December 2009 through December 2010 in compliance with the DOI TCRA Work Plan. During this time, approximately 11,800 tons of waste was removed from the AOC 4 Debris Ravine. On March 15, 2011, PG&E completed the Implementation Report for the Time-Critical Removal Action at AOC 4, Pacific Gas and Electric Company Topock Compressor Station, Needles, California.